I am writing this blog post on my flight to Little Rock! That’s right today I get to see my airman! I just saw him about 3 weeks ago, but when your airman gets back from deployment they will have all sorts of leave time available to them. They are given 2 weeks of paid leave where they must stay within so many miles of the base they are stationed at. Once those 2 weeks are up, they can then choose to use some of their leave to return home, or save it. Because of my work schedule in June, Taylor chose to save his and now we are going to be able to take quite the amazing trip together. Tonight I land in Little Rock and tomorrow we start our drive back to Nevada together. We will be taking 3 days and stopping at places on our way. Thanks to one of Lauren’s previous blog posts I was introduced to Roadtrippers and have our whole trip planned out from start to finish! One of those stops includes the Grand Canyon, which is a little off of our route, but I am sure it will be totally worth it! So enough about my road trip and back to business…well not really because this is a pretty exciting blog post! Today I get to write about the day your significant other COMES HOME!! It is a day neither of you will forget especially if it is a first deployment. There is nothing like the feeling of accomplishment you get when you are in the arms of your airman again! Again, remember Silence means Security! Keep our loved ones safe by staying hush about deployment dates and arrivals. I went over this in my previous deployment overview post, but thought I would just recap briefly. Just like when they deploy, you won’t know when your significant other will be coming home until what seems like last minute. When Taylor left we thought he would be coming home May 15th, but once he got there they told him it would be anywhere from May 15th. Even though this is frustrating, especially if you are trying to make travel plans, just remember it is a safety precaution taken by the Air Force to ensure the safety of your airman. On May 3rd, Taylor called me with a for sure date of May 20th. Again, this was not information that I shared on social media. He told his mom and then I told my parents so they knew when I would be leaving. I also had to figure out work because as the Game Day Producer for a Triple A baseball team I am not exactly supposed to miss games, but I was going to have to. So, I had to take my boss aside and figure out work plans with her. Other than that though nobody else really knew when I was leaving, or when he was going to be home. It was not until his plane landed on the flight line and I was in his arms again that I put anything on social media. So obviously with me living in Nevada the first thing I had to figure out were my travel plans. I did not want to mess with being late on the day of his arrival, so I made my flight reservations for the 19th. This way I was there a day before he was supposed to be and would not have to worry about not being there to welcome him home. Because I was going be getting there before him I also needed to make sure I had a ride from the airport. So I got a hold of his best friend and roommate Travis, who was able to pick me up and take me back to their house. I also planned it out so I would be there with him for the full 2 weeks of paid leave he was given. The past couple times I have gone to Little Rock he has always had to work, making doing things or going places difficult. So I knew that with all his time off it would be the perfect opportunity for us to really enjoy being in Little Rock together. If you are married to your deployed airman, then this is not something you will have to worry about. However, if you are not make sure you go into the general base information building outside of most main gates and get a base id the day before their return. The morning of I guarantee you there will be a line of people waiting to get base ids. So to save you time just do it the day before. Needing a base id was another good thing about having Travis. Make sure you have someone who can take you in to get a base id. If you don’t know someone who can go in with you to get you a base id my best advice would be to call, or go in to find out what you will need to do to get one, so you can be there to welcome your significant other home! Most significant others get all cute and dressed up for the return of their airman. There were significant others dressed in anything from skirts and high heels to others, like myself, in a nice pair of jeans and a cute shirt or blouse. There is really no specific way you have to dress. I chose jeans because I knew that I wanted to jump into Taylor’s arms the minute I saw him and that wouldn’t have been very easy to do in a dress! 🙂 Then there were little kids all dolled up in matching red, white and blue attire with signs welcoming their daddy’s and mommy’s home from Afghanistan. Many of the significant others had signs as well, but for me I was just keeping it simple. It was out first deployment and I was just so excited to jump in his arms that I didn’t want to have a sign to worry about. However, maybe next time I will make a sign. Just remember, don’t feel obligated to get all dolled up and have a sign welcoming your airman home…you have just accomplished one of the hardest obstacles in a military relationship…just be there to welcome that airman of yours back home! The good thing about having Travis was that I had an inside scoop on when Taylor would be landing. He went to work after picking me up from the airport and called around 7:00 a.m. to tell me that they had all been told the plane from Afghanistan would be landing early. He was able to get off work and come get me from the house. However, you really do not need a Travis to know when your airman will be landing. They told us the plane would be landing between 9:30 and 10:00 and it ended up landing a little after 9:00. So find out an approximate landing time and then just get there early! Waiting for his plane to land. This is all of the people standing behind the rope they had set up that we were not allowed to go past until they stated getting off the plane. Because I had Travis I did not really have to figure out where on base Taylor would be landing. Most of the time your significant other will land around their squadron building. If you do not know where this is, or where they will be landing find this information out the day before by calling, or going into the information office that is normally located outside the main gate. Taylor also called me during his layover when he landed back in the states. They gave them all an idea of when the plane would take off again and how long the flight would be, so I had a bit of an idea myself when he would land in Arkansas. They had a rope up that you were not allowed to pass until the plane landed and the cabin door was open. Because we got there early I had a pretty good spot where I knew I would be able to see from when they began getting off the plane. When the plane lands and the doors are open they will let down the rope and everyone is free to run toward the plane and to their airman. I knew that when they finally let down that rope it was going to get crazy. So once the plane landed, the cabin door opened and they began coming down the stairs I just walked towards the plane and as I walked I looked for Taylor. I didn’t want to run because I was worried I would totally run right past him….and anyone who knows me knows this would happen to me. When I finally saw him I began running towards him and jumped into his arms! I have never felt so relieved and happy to see him. There is seriously no feeling like it! For the first time in a little over 5 months I felt at home….in the arms of my airman. Once again having Travis was awesome! He took pictures and got ones that I didn’t even think he would! Then we took a couple more pictures and went to go pick up his truck. Because of course he was almost as happy see it as he was to see me 😉 just kidding, but the boy seriously loves his truck. So Travis took us to his truck and then we drove to where they had told us they could get their luggage. After he had his bags and received his in processing folder the rest of the day was ours! This will be different for everyone just depending on how your airman feels once they get off the plane. For us though this was a busy, busy day! Because Travis moved Taylor and himself out of the apartment and into their house while Taylor was in Afghanistan, he hadn’t seen the house yet. So, we left base and went directly to their new house. This was really good because he was able to kind of settle in and get changed before we went to lunch, which he was super excited about. He had been craving chips, salsa and a hamburger for so long and now he could finally have it all! So I took him out to lunch at Chilis and yes I paid 🙂 it felt good to feed my airman his first meal back in the states! I am pretty sure he enjoyed every last bite! The next thing we did was go to Burlington Coat Factory where we bought him all sorts of new things for his new house. I wanted to make sure that he felt as at home as possible on his first night back. We bought new bathroom towels and a new bedding set! A new house calls for some new things! Then we went to Verizon. Taylor was going to get a new phone before going to the desert, but they lady at Verizon told him to wait because deploying is hard on a phone. So, if your airman has a nice phone before they deploy make sure they have a really sturdy case that with keep any weather and sand out. Taylor’s Droid barely made it through deployment. By the time we had gone to lunch and shopping it had restarted at least 5 times and factory reset itself. So we spent much of our afternoon at Verizon setting Taylor up with a new phone. If we had not already been crazy enough we then decided to go and have my ring checked. It was due for its first cleaning and in order to keep the insurance I need to have it checked and cleaned every 6 months. So we went to the jeweler and got that all taken care of. We got a lot accomplished in that first day he was back, but it actually worked out really well because we had the rest of the week to just enjoy ourselves and being back together again. When he was finally at the wheel of his truck again! This was the day after he returned from Afghanistan when he put on Senior Airman. The day after your significant other comes back from deployment they will need to go in for in processing and get all sorts of check ups done to make sure they have come back from the desert healthy. This takes just about all morning, so don’t make any plans for most of the day after your airman returns. Well that is pretty much it! What you do the day your significant other returns is really all up to you and your airman. Like I said it will be different for everyone. Just enjoy every second you have with each other and never take a day together for granted. You are now a deployment champ and believe me after this I am pretty sure you will be able to conquer anything else the life of being a military significant other has to throw your way! It is not easy, but it is possible to get through. Always remember that each passing day is just one day closer to being in your significant others arms again! This is it for me in this June series about becoming a deployment champ! I hope I have given you some insight and helpful hints to guide you along the way! You may hear from me again later down the road, but if you ever need anything or have questions feel free to find me on Facebook! I have been through a lot with my airman and like helping others and giving any advice I can! After this this month’s series, you’ll be exactly that – deployment champs. So without further ado, I’m excited to introduce the June Series at The Real Sweetheart: Becoming Deployment Champs! Not only are we doing a new series, but we also have two guest bloggers this month – Kaitlin Haugen and Marjorie Santiago! 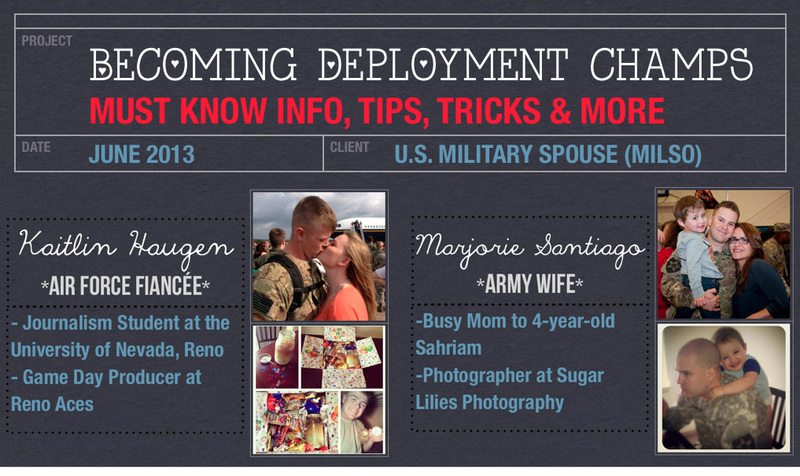 Both are significant others of soldiers and have dealt with deployments and are here to share their wisdom to fellow newbie wives! I’m thrilled to have them on board! There are five key things to know before making a trip to Fort Benning, GA – especially if you are under the age of 25! Before Blair’s Family Weekend Pass from his BCT graduation I struggled with planning the trip from Nevada to Georgia. To me, buying a plane ticket, booking a hotel room and picking Blair up was simple. But after taking away the option of me renting a rental car, I might as well have run into a concrete barrier. Apparently, rental car companies restrict people under the age of 25 from renting a car… And I was 19 at the time so I was in some serious trip planning trouble. While there might have been a few that would rent out to someone younger than that, the extra charges on top of the base rental fee was not worth it. So, I simply just had to do a little bit more planning. Being three months into being an Army wife at this point, I was wishing that there was some magical site that would tell me all the answers to solving my dilemma. There wasn’t. And everyday after getting off of work, I searched for the best bargains, military friendly deals and tips to making this trip easy going and stress free. Below are the five key things to keep in mind while planning this trip. The extra planning is well worth it in the end – trust me! Just make sure to follow these steps and truly enjoy your time with your loved one and the Family Weekend Pass will be a success! If a rental car from the Hartsfield–Jackson Atlanta International Airport isn’t an option, call Groome Transport. Truth be told, it is a shuttle, you are on it for a good hour and a half/two hours and it isn’t the most comfortable or best smelling when it comes to traveling with others in the hot and humid Georgian heat. There is a military discount if you take the shuttle to the base, but in my case, since we stayed at a hotel in Columbus, GA (the city surrounding Fort Benning), I was not able to receive it. *Something to keep in mind is that Army “girlfriends” do not have access to military discounts! You have to be a spouse/family member and have a military identification card to receive most military discounts. No car = Taxi Cab. I took American Taxi Cab Co. back and forth from our hotel to Benning and I loved them. Their rates were fair and super friendly. Plus, if you call the same driver for your pick-ups, they tend to give you a discount for your “loyalty”! Please note that not all taxi companies have the ability to go onto base! Each one has to pass a security process to be able to drive on base, so if you decide to use another taxi cab company, just make sure they have access. You are going to need it! All I really need to say with this tip is stay off and away from Victory Drive. With this road being less than a mile away from Fort Benning’s main gate, it’s easy to pick a hotel right there. However, most Drill Sergeants tell the boys to stay away from that area due to it not being the best of places (crime, shootings, etc.). For me, exit 10 off of Interstate 185 in Columbus is the best spot to stay. We stayed at the Wyndham Garden Columbus, which ended up being about twenty miles away from Harmony Church where Blair was at Basic Training. While it does seem a little costly to be 20 miles away from the base (taxi rides were about $40 to the base), it was well worth it because you end up being close to good food stops (IHOP, Hooters for those certain boys, etc.) and a huge movie theater. Another thing to keep in mind is that most of the boys will want to be as far away from Benning as possible. They’ve been there for the past three months or so and want to enjoy their break – not wake up to look out the window and see the place they likely dread the most! *A good rule of thumb is to stay within 30 miles of the base. Driving and visiting Atlanta is super against the rules. Do it at your own risk! In the Army, “on time” is late, yet too early is obnoxious. Just plan on leaving reasonably early for wherever you go. I planned on arriving to Georgia the day before the BCT graduation ceremony. This was the perfect amount of time for me to relax, calm my nerves (I was literally uncontrollably excited and nervous – it was a huge moment in my personal and married life!) and iron my outfits for the next few days. When it came to the actual graduation, I ended up being four hours too early… All I can say is that I was a tad bit confused on when the ceremony was. Luckily, Blair’s battle buddy’s wife had done the same! So we walked and talked and tried to calm each other down from our excitement the best we could. When it is time for them to report back, half an hour prior was a good amount of time to say your goodbyes and once again leave them. This was the hardest part about this trip, but what I’ve come to realize is that it is a huge part of being an Army wife. Just stay strong, say your prayers and start writing him letters again as soon as he starts walking back to his troop. Now this last bit isn’t quite a tip, but rather just common sense. Make sure as a spouse or a family member, that your soldier stays in his uniform if out in public, stays in his pt clothes if walking around the hotel and that he always says sir or ma’am. And if they do run into a Drill Sergeant, they should always stand at parade rest. Nothing too hard for any of them considering they have done all of these things every day for the past three months. Remember that Drill Sergeants give out rules for a reason. If your soldier decides not to follow them, it is their choice. But as a loved one, push them to do the right thing! Because they really won’t want to mess up the last three months of training they have already had and start again from Day 0 if caught – and yes, that does happen! I hope that this is helpful to someone out there – I know I sure would have loved to have this for direction!